We are very proud of the holidays we arrange in Morocco but no one says it better than you, our wonderful customers who have tried and tested our holidays…. Once again, everything you arranged was perfect. I really have to make a special mention though for the wonderful gang at Riad Chbanate – some of the friendliest people we’ve met who completely looked after us and made us feel so very welcome. They were great. It was of course Ramadan whilst we were there & while it was quieter, Essaouira was still vibrant and lively – we really love the laid back feel of the place and only wished we could have stayed for the music festival which looks amazing. We popped along to have a look at both Villa Maroc and Heure Bleue as you’d recommended them previously. We thought Villa Maroc gorgeous so will definitely consider that next time. I think as I’m a coeliac and Chrissie’s vegan we always get a bit nervous when places also want to cook but having been there we feel totally confident they could cope with us!!! And as for Heure Bleue – we couldn’t quite believe it was in Essaouira – it’s like stepping into another world! (And as for that pool….) We’ll definitely pop in for a drink on our next visit or maybe treat ourselves to a stay. 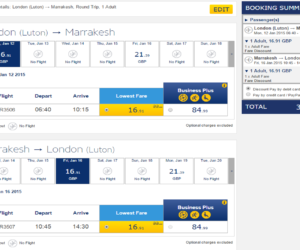 The flight, Luton – Essaouira was so easy and the only downside of the whole holiday was discovering that Easy Jet have stopped all flights in July & August, resume them until the end of October but currently have no schedule beyond that. They have apparently been threatening to discontinue direct flights and this may be taking affect from November. Such a shame. Anyway, we’ll be back however we have to get there! Lauretta Z. May 2018: ‘It was magical and anything anybody could imagine and wish for. From the places we stayed at, to the food, to the organization of everything. Barbara was of enormous help even tho I called her last minute to help us find adeguate places. It was much more than we expected. Helaine H. May 2018: ‘Rebel Riad, absolutely wonderful, really enjoyed the cooking class and the overall atmosphere. We had dinner the first night for our group of 12, we found it perhaps a little small (could have used one more tagine for the group). Breakfasts were great, and facilities well looked after. Riad El Zohar, Allen was fabulous, so helpful and very nice!! My only comment would be that if you were there with other people (strangers) in the other rooms, if you have a noisy group, could be noisy, as the windows face into the courtyard. Christina H. April 2018: ‘It was the perfect vacation for our family of 6. It was such a great location to go back and forth from private pool to the public beach. Our hosts, Mohamed, Fatima, and staff were super friendly and so helpful. They would check up on us every day to make sure our needs were satisfied. I would recommend this place to anyone looking for a relaxing and beautiful place to stay. It was so easy working with Fleewinter and super helpful. I was so impressed with how quickly you responded to all my questions and needs. They took the stress out of making all of our travel arrangements in a foreign country so I could relax and enjoy it. Our driver was waiting for us when we finally made it through customs and exchanged money for our stay. He was super friendly. He even found a stopping point when asked if we could buy something to eat since our flight came in after dinner time. Daniel R. April 2018:‘ Thank’s for the assistance with regards to our trip to Marrakech this weekend. We had a great time, nine friends spending a few days together, played some golf and had great fun. Dar Ayniwen is a jewel. Aziz was really helpful and assisted us in all the transports to the city and the golf courses as well as with the city guides and restaurant reservations. Transports that you booked for us also worked as expected. Pernille F. March 2018: ‘So we have returned from our trip to Morocco. It has been one of the most amazing and memorable family holidays we’ve had. All the places we stayed were perfect and the order of the itinerary was spot on. We had been slightly concerned that we wouldn’t have enough time in Marrakech but it was ideal. There has been so much to take in and process from everywhere. It was a lovely start to just relax at Rebald Riads and we were so well looked after by Mohamed and Fatima. Breakfast and dinner on our terrace was beautiful. All the staff were so attentive and friendly. At Bab Ourika we felt very spoiled with the beautiful views everywhere we looked and the food was gorgeous. We had a stunning 3 hour walk with a fantastic guide around Setti Fatima waterfalls. And what can I say for Allan and his amazing staff at Riad El Zohar? Beautiful place to stay and he really made our stay in Marrakech very special. If not for him it would have been a very different visit I’m sure. He made the souks and the medina easy to navigate and made us feel so welcome helping us to choose and book restaurants and recommending places to visit and what to avoid. Having been feeling a bit apprehensive of the souks we ended up having so much fun there. His staff were so friendly and helpful and nothing was too much trouble. Can I also say what helpful and friendly drivers we encountered through Tabarak. In particular our driver taking us from Sidi Kaouki to the Atlas Mountains and again from there to Marrakech. Very informative. Merrell V. March 2018: ‘Jenna was amazing from start to finish. She stood out from other travel operators I contacted. Jenna was positive, friendly and professional. Huge thanks to her from Matt and me. All our drivers spoke good English and were friendly. We were able to chat about life in Morocco which was very interesting. Kathy P. March 2018: ‘Barbara was very helpful and efficient and responded very quickly to queries. It was altogether a very easy and straightforward booking process with clear communication at every stage. Jennie S. March 2018: ‘Excellent. Plenty of good suggestions for where to stay and what to do, very prompt emails and lots of information. Many thanks Barbara! Riad El Zohar – excellent. Wonderful host and staff who look after you really well, beautiful riad and excellent location. And so quiet! Villa Quieta – also very good, bit further out of town than perhaps we expected, but a lovely easy walk to town. Again a beautiful hotel, with a pretty garden and pool. Food at El Zohar was excellent, we also really liked Cafe Arabe in Marrakech. Jardin Majorelle was beautiful, but worth going to the YSL museum first, buying a combined ticket and then going into gardens and avoiding queues! Day trip to Atlas Mountains was great too, excellent guide who took us on a beautiful hike through the mountains, very knowledgeable and interesting. Sean M. March 2019: ‘From start to finish, and down to the fine detail, Barbra was absolutely excellent. She works to a very high level of professionalism while maintaining a lightness of heart, this in turn has the effect for the customer of being able to look forward to the trip in full confidence of knowing your requirements are being attended to. Riad El Zohar: from start to finish, excellent! Allan is a true gentleman & his personal touch really added to the buzz of the whole experience. The riad is beautifully furnished, location is wonderfully quiet, food is excellent, staff are charming-THE WAY A GOOD TRAVEL EXPERIENCE SHOULD BE! Dar Maya: Lovely riad, super room ‘Tignna’, Youseff is a great concierge, nice location quiet but close to everything, perfect for Essauoira! Julie H. January 2018: ‘ A stunning Riad and fantastic service . John and his staff are attentive to your every need . The bedrooms and decor are unique and such attention to detail really made our stay a very special one . John couldn’t do more to help us and we were so grateful , what a find ! Sally L. January 2018: ‘Ryad Mabrouka excellent but cold due to unusual weather. Staff excellent and food good . Good position on edge of medina with good outlook . Claire G. January 2018:‘ Rebali was fantastic in every way. Felt very spoilt and for a really great price. Food was best we had in Morocco! Mark G. January 2018: ‘If you wanted an example for the website of a family (2 adults, a teen and a nine year old) saying things couldn’t have gone better, then we would be that family. In the past we have normally driven ourselves, booked our own accommodation, food etc, avoiding the group mind of the traditional package holiday. Using a bespoke service like yourselves has proved a revelation. The transfers were always on time, courteous and luxurious. We never arrived at any of our destinations late, more often a few minutes early. The accommodation at The Riad el Zohar, Rebali Riads & Scarabeo camp exceeded our expectations. Sumptious, perfectly situated, & staff at all three helpful and friendly beyond anything we could have expected. Alan at REZ sat us down over tea and talked us through the ins and outs of Marakesh for an hour (we saw him do this wine subsequent guests too). Meals were served when we wished, and were first class. His staff we delightful. Mohammed & Fatima at RR made our stay effortless: booking events (body boarding, Quad bike excursion), paying bills at restaurants, getting Moroccan money, arranging cabs. The food was great, and the service incredible; in our own riad, a fire started for us, all cleared away. At SC all the staff were attentive, the camp was spectacular, the insides of the tents beautifully appointed. The food here too was amazing. On top of that the hike in the Atlas Mountains was fantastic, (4 days after the heaviest snow fall in 45 years, it was like Switzerland. So beautiful). The camel trek, and the star gazing in the desert (OMG, we’ve never seen a star field quite like it) on the last day just rounded things off so magically. Everything fell into place. Everything was as thrilling, or romantic, or staggering as we hoped it would be. To have packed so much adventure into 10 days, and yet come away so relaxed and de-stressed has been a remarkable experience. Mary and I work in film and TV and have travelled for work our entire adult lives. We know how things can go wrong. This was the antithesis of all that. The perfect family holiday. 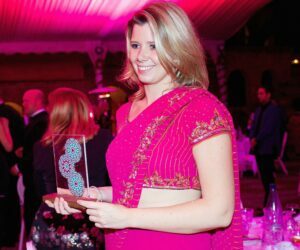 Emily R. December 2017: ‘Barbara was absolutely amazing – responding immediately to every question and request, and helping us but together the perfect itinerary. Flying from Marrakech to Fes on Airarabia was extremely easy – definitely recommend! We can’t say enough about Mohammed (Our driver for the week). He is an amazing person, a wonderful guide, and a incredible ambassador for his country. He made our trip even more special and meaningful by sharing his culture, religion, and love of Morocco. From now on, whenever we think about our trip to Morocco, we will remember Mohammed first! Ron L. December 2017: ‘ Although seasoned travellers, we didn’t feel confident to put together a 2 centre trip in a country where english isn’t their 1st (or 2rd) language. I came across FleeWinter after a quick search, but was slightly apprehensive of engaging them – especially since their online testimonials are so out of date. However I needn’t have worried and I have been delighted by their professionalism and on the ground know-how. I would not hesitate to use FleeWinter again. Our only disappointment was outside of FleeWinter’s control – the weather: rain, rain rain! Hohum. Some you win, some you loose. Despite having a slightly last min change of plan (ditching a long train transfer from Marrakech to Fez for a 1 hour plane hop) the change was undertaken swiftly with no fuss. Marrakech: Riad el Zohar (5). Superb, slightly bohemian style riad. Excellent friendly, helpful staff. Great, quiet location. Nicely laid out terrace with ample varied seating. We had not stayed in a riad before so were a bit taken aback by the ‘laid-back’ approach of the staff and room security: rooms have no proper door locks and windows are open to the central courtyard. Obviously they can be shuttered close at night. Breakfasts are also rather samey, with heavy sweet bias, but this may just be a Moroccan thing. Unfortunately visiting in early Jan temps were low and rain high and the riad was only 1/4 full. I would really like to revisit this riad later in the year to enjoy the full experience as I think it would be fantastic. 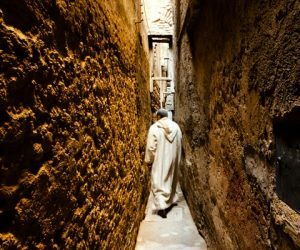 Fez: Ryad Mabrouka: Visiting in early Jan I feel we really caught this place at its worst! Although the manager did his best to greet us, his english isn’t the best outside of what he needs to tell you. The central fountain was only switched on when guests were arriving, central lighting was only fully switched for a couple of hours each eve. Despite it’s ‘no expense spared’ initial refurb this ryad always felt cold and empty (you literally had to hunt the staff for drinks – the bell was ‘for emergency only’). Breakfast was always politely presented to your table but looked basic. Shame – as the ryad (and our room) are jaw-droppingly palatial. No amount of reading can prepare the new comer for the pushiness of the traders both in the Souks and market squares. And despite guidebooks suggestion to embrace bartering, the process can really spoil the experience. I found it far more relaxing to simply look and not buy anything. On recommendation we enjoyed meals at the Clock Cafe in both towns, being the safe option for english palettes. However this safeness comes at a price and we found we could eat at half the price in local cafes once we had grown braver. Iona U. December 2017: ‘Each accommodation booked was exactly what we had been hoping for. 5 stars each for Villa Maroc, Douar Samra and Riad el Zohar. The staff were all extremely welcoming, our rooms were lovely and food was pretty good everywhere we went. Essaouira was perfect for easing us into the morrocan culture. Worth noting that Scottish notes were not welcome at the currency exchange and this could be included in the guide as a reminder. Also, restaurant de la Baie has changed hands, and name, and Ferdaous no longer exists. We did go to Les Alizes, which was our favourite meal of the whole week- the owner was lovely, food was incredible and such good value. Taros was also a lot of fun for a cocktail. It was not too much of a journey to head from the coast into the high atlas, and we were well looked after in Douar Samra. Would recommend booking a guide in advance if you only have a one full day there and want a guided trek. Marrakech was a lot of fun. Made less intimidating by the wealth of knowledge that out Riad owner Allan passed on to us. The Majorelle Gardens were beautiful and the Berber Museum fascinating, especially after our time in the high atlas. We enjoyed the Badi palace, the Bahia palace and the Sadiian tombs. Polly B. 2017: ‘Thank you for your message. Whilst it was horrific getting home at 2 am on Monday morning and then setting off to work 5 hours later I cannot thank you enough for creating the most wonderful holiday for us. We had the most lovely time – everything worked superbly and both the hotels were excellent. I have just finished writing a trip advisor report for them and could not have been more complimentary. The only thing which I criticised slightly was the the Riad’s beds were a little small for us old marrieds!! I will, of course, do the feedback form. The transfers were superb – you may have heard that we meddled with the one on Sunday as we went and spent the day at Ourika Organic with Amanda – we had the most superb time cooking with her and her husband – an absolutely sensational way of spending our last day away. All in all we were very happy punters and we will not hesitate to use Fleewinter in future – so impressed. Jane M. September 2017: ‘Thank you for an amazing trip. You will see from our feedback, we had a wonderful time. Genuinely from the moment we first spoke, I felt comfortable and safe that we would have the holiday that we wanted and you delivered : over and above our expectations. If we were to do it again, we would probably say to go further out of the desert for a stop – back to Kasbah Azul, but having said that the hotel was great, we just preferred Kasbah Azul and would have been happy to have the driving split a little more evenly. That said, that was a very minor change. Also we would go into the desert for 2 nights but we weren’t to know how blown away we would be by being there. Carolyn O. September 2017: ‘Thank you so much for arranging our trip to Morocco. I must say I hadn’t heard of Fleewinter until I saw a link in a newspaper relating to holidays in Morocco. Before progressing too far I did investigate Fleewinter just in case I was sending a lot of money and getting nothing back! You made me feel very confident once I had decided Fleewinter did exist in the real world. You were very tolerant of our changes to the itinerary ……and … I was very pleased you were able to reply quickly to last minute emails regarding airport transfer, thank you. Traffic turned out to be very light and despite security checks were we at the gate in plenty of time. Thank you. We would never have discovered the lovely individual places to stay without Fleewinter. We could have researched but you never really know. Dar les Sirenes suited us very well, we enjoyed staying in the part of the Medina where people actually lived and worked. You were right about spending time in a quieter town first. We enjoyed our stay in Essaouira the staff were kind and attentive and the property beautifully designed. Douar Samra was something different, I would never have chosen to stay there if it hadn’t been suggested on your site! The concept was interesting, food and staff were great. We appreciated the donkey too, he took our luggage up the hill at the end of out stay. I did feel visitors had to be relatively agile at the property, lots of steps and changes in levels in dim conditions ….. all part of the experience, in a house on the side of a mountain, you’d say! Scarabeo Camp, was a bit of a touristy experience. The tents were huge, candle light everywhere, it was a bit like being on a film set! The tent for the meal looked great, food left a bit to be desired however were we out in an isolated spot not in a 5 star restaurant. Only down side – the beds were very hard. Fiona P. July 2017: ‘We had one main driver – Said – who took us over the Atlas Mountains and all the way to Rebali Ryads. He was an excellent driver. Very calm, and safe. He drove with great care and I never felt concerned once. All the places were 1st class. All unique, welcoming and the food and service was fabulous. Susan G. June 2017: ‘Wonderful, friendly guides who made our stay fantastic, safe at all times, would recommend Majoub and his friend Said. Chagaga tents were amazing although staff very friendly on arrival but next morning very offhand and disinterested. ‘Booking Process: Barbara, you are so efficient, nothing is too much trouble and it was all made so easy. Super quick responses to my many questions were hugely appreciated too. Rebali: 5* for Rebali. I can honestly say we had the best time. Accommodation was great, tidy and clean. We loved having our own pool. The food was so so good- we ate in every evening. The staff completely round off the experience. Nothing is too much trouble. Mohamed, Fatima – everyone made us feel so at home. They also saw that it was one of the girls birthday by seeing some birthday cards on the table- we then came back after a day exploring the souks in Essaouira to find a cake, and a birthday banner- just so great! Corinna K April 2017: ‘ Perfect: I got confused with the date of the flights on the travel consultant, Barbara podbial, rearranged all the hotels and trips to the new travel date, only 2 weeks prior to leaving. All the accomodations were beautiful, food was fantastic, service excellent; only thing that maybe wasn’t 100% ideal: when we arrived at the riad on marrakech (les 3 mages) in the evening after the flight w ehad to wait a bit too long before we could go into our rooms and have dinner. Yukie W. April 2017: ‘I loved everything about Morocco, and I am sure all the recommendations helped me to have the best possible experience! I was in a bit of a rush, and very busy at the time, so I tooke a long time to respond and decide. Fleewinter was very accommodating and efficient even though I made it very hard to finalize everything. Lina Riad (Chefchaouen): super good spa, friendly personnel and I am just sorry I didn’t stay there longer. Riad Laarousa (Fez): Perfect location, amazing room, and oasis in Fez. Riad Hikaya (Marrakesh): Jane was a lovely hostess and I loved all the personnel. I noticed it was all-female, which pleases me. Location regarding my lovev of walking everywhere wasn’t great, but compensated by everything else and the convenience of having a car on the doorstep.I cannot rave enough about Morocco. I was concerned about being a female solo traveler, which ended up not being a problem at all. But I understand it has to do with the personality and attitude. I do love shopping and it was great being able to go mostly to social responsible cooperatives and women empowering organizations. It looks like a detail, but it was really enjoyable experience. Victor D. March 2017: ‘Our trip as excellent on all fronts Anna was excellent answering all our questions, providing information and suggestions, changing things happily when we need to adjust dates etc. The guide we had was a highlight, kind, interesting welcoming and proud of his country the various hotels and the camp were inviting, clean and welcoming and while they ranged in style all added to our experience. As I told Anna it is experiences like this where your realize the shortfall of the Expedia’s of the world. A truly professional travel agent brings a whole level of expertise and makes the trip much less stress and much more pleasurable. Sandie S. March 2017: ‘One of the best holidays we’ve ever had. Morocco and it’s warm and welcoming people is an amazing country. It’s a short hop from the UK but you feel you’re in a different world. The behind the scenes organisation by Fleewinter meant that we could sit back and enjoy it, knowing everything would happen as planned. We can honestly say that there is no part of the holiday that we didn’t thoroughly enjoy – and that’s rare when four completely different peope go away together. We loved Fez, and could not have managed without our local guide Hamido, who was a total star. 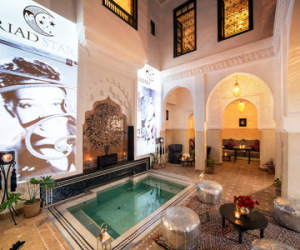 We really liked Riad Laaroussa, a lovely building and atmosphere, very friendly staff, although sometimes a little bit less than professional – especially the spa staff who were a bit intimidating when it came to tips. It is not possible to give this feedback to the Riad management without feeling you are getting the spa staff into trouble. After and easy train journey from Fez, we found Marrakech a bit touristy and preferred our second day when we visited the main cultural sites, like the palaces, Saadian Tombs and the Qu’ran School, rather than the souks and the main square which we saw on our first day. Riad Hikaya was lovely, the staff charming, we had a log fire in our room every night, and ‘Mr John’ gave us so much advice Marrakech that we would have needed a month to go everywhere he suggested! The nesting storks were a treat. Lahsan, our driver for the mountains and desert trip was excellent, the drive over the mountains really nice, and the desert camp absolutely brilliant. We enjoyed the camel ride to the dunes at sunset, dancing round the fire in the evening, stargazing, getting up for sunrise, and the fascinating off road driving. Lahsan’s local knowledge and love of the desert made it really special. Both the hotels we stayed at were lovely with nice staff and good food. In Essauoria we wound down and enjoyed the ambience and the central location of Hotel Heure Blue, we ate informally on the windy roof terrace with its lovely views and had Kemia in the courtyard, and a nightcap in the English Bar. The breakfast buffet was enormous, so we only needed snacks during the day. We had a brilliant massage at the hotel. The port area and the medina were fascinating, it was a bit breezy and cloudy for the beach and on Sunday morning full of football teams, which were fun to watch. Ali B. January 2017: ‘ We had a wonderful holiday despite the coldest January in Morocco for 20 years. Everything worked to schedule, thank you. 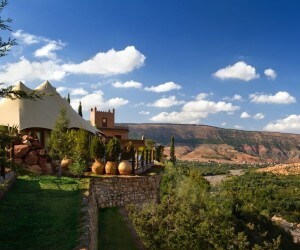 Kasbah Bab Ourika 5 Excellent; Loved it and definitely hope to go back.Superb setting, great welcome and good food. Luxury Camp El Chegaga 5 Excellent. Bab Rimal: 4 – accommodation not with the really ‘cared for’ appearance but food better than Azul, and staff very friendly and helpful. Riad El Zohar: 5 Excellent, though reception rooms could have been warmer! However, a lovely log fire was lit each evening for us, and it was exceptionally cold weather. We’ll definitely hope to go back to the Ourika valley. Hassan, guide, led us through National Park; we lunched in a berber home in Taourite – very friendly hosts. Stunning setting. Desert trip with Hamada tours was good though the lunch stops/cafes were not ones we would have chosen! However, Guide and driver were pleasant and guide well informed about culture and country as a whole. Would have welcomed a little more information on geology and plantlife we encountered. El Chegaga camp was superb! Brad H. Januray 2017: ‘We were overall very pleased with the trip. No problems occurred. Bonus points for me as my partner does not really trust me to organise any trip and she suffers from pangs of concern that something has been forgotten or missed! The transfers all worked out well – there was no delay or problems experienced with any. In Marrakech, the driver is supposed to pay the porters that collected luggage to-/from- the riad. In one case we tipped the porter before the driver had paid and the driver did not subsequently pay the porter. Question of whether the tipping is warranted in this case and if not be clear on the itinerary about it. We rated the accommodation very highly and would spend time in them again and not hesitate to recommend them both to others. The riad in Marrakech was very nice and has an excellent and genial host in Alan. The location was also very good and a bit of a challenge to find sometimes (part of the fun). Breakfeast was generous and dinner (the one time we ate dinner in the riad) was onerous by volume of alone! Food quality was very good. Lizzie D. December 2016: ‘Just fantastic – Barbara was an absolute star and arranged pretty much the perfect holiday for us! Thank you for a brilliant Christmas away! Annie S. December 2016: ‘A fantastic family experience – with just a week window for a family of 4 with 2 teenage boys this holiday gave us a wonderful taste for Morocco, great range of different venues and activities, friendly people and lovely food we hope to be able to revisit again soon. Rebali Riads (5) – a perfect place to arrive in Morocco and relax – the accommodation was wonderful and spacious, breakfast was good and excellent evening meal in the riad. Mohammed, our host was at hand to advice and help organise activities, the staff all friendly and helpful and the facilities great. Riad El Zohar (5) – a beautiful, tranquil space in the midst of the wonderful buzz of Marrakesh. The riad is delightfully appointed and all the staff were fantastic. Alan, the owners love and knowledge of the city helped us make the most of a short window of time to really enjoy and get a taste for the city. Charmaine B. November 2016: ‘My holiday to Morocco has to be one of the best my partner and myself have been on. It was truly fantastic. The service we received from all the hotels and people we encountered were second to none. Everything was handled so professionally and so friendly. Rebali Riads- This by far has to be our favourite! From the moment we arrived, Mohammed and Fatima treated us like family. We were upgraded for free to what could be described as a mansion. They attended to us every day with anything we could possibly have needed/wanted. They were so incredible to us, going above and beyond to accommodate us. I unfortunately hurt myself on one of the days, and Fatima came straight over and mended my hurt foot and stayed with me and helped me recover. She was truly a star. Could not sing any higher praises for this place. The other staff as well were so so friendly, always stopping to have a chat with us to make sure we were happy and comfortable. Alison G. November 2016: ‘Fleewinter performance was absolutely first class. Super helpful at every step of the way. Guided us to make the right selections in both cases. Doaur Samra was lovely, we enjoyed everything about this wonderful place. Welcoming staff, wonderful food, lovely comfortable rooms and amazing views. Would love to go back. Zareena M. October 2016: ‘The whole process was so easy, from contacting the travel consultant and telling them exactly what we were looking for. Our consultant was Barbara who was a fantastic help and sorted all the accommodation booking out for us. She had a good knowledge of where we”d be staying and was able to offer good advice. Communication was good, open and frequent, if we had a query then she would get back to us within a matter of a day. Thank you Barbara your help was much appreciated and it made the whole booking process so easy and straight forwardThe accommodation was like a little part of paradise. It was idyllic. Everything was so well maintained and the staff who look after and manage the place work so hard and put so much effort in keeping it that way. All the staff were so friendly and looked after us so well. Nothing was too much trouble for them and they were very professional and discreet. I would definitely recommend Rebali Riads to my family and friends and I most certainly will visit again at some point in the future. Sidi Kaouki is such a friendly little place, we loved it. There’s not a lot to do in the evenings but we headed out to Essaouira on a couple of days which is only 30mins away. We either eat at Rebali or at Momo”s which we enjoyed. Be warned about the dogs barking at night (you do get used to it) and the camel poo on the beach. Mike F. October 2016: ‘We rested at Rebali so enjoyed roof garden and beach especially La Mouette. Went to Assaouira and a day did it … a bit too basic and while i loved the docks (early nineteenth technology with people everywhere making it work) the girls could not stand the smell. Not the pretty down as billed but worth a look and a roof-top meal. Tamadot … well, you need to afford it but other than that just go there as it is all good, so well thought out even down to the walks and people. Jennie H. October 2016: ‘I just wanted to let you know how we got on in Morocco. Tabarak transport are brilliant, we were delayed by over an hour on departure and he was still waiting for us when we arrived, and they were prompt when collecting us from Douar Samra even though its in the middle of nowhere! Riad star was nice, in a good location but they were doing a little bit of renovations and I didn’t love it as much as Riad Hikaya, but they were still very welcoming and helpful, plus having a room large enough to comfortably accommodate us all was amazing. I think I just prefer the more traditional look and feel of Hikaya, although location wise this was perfect for my children. I loved seeing their shocked faces wandering around the souks amid all the hectic noise with scooters and mules! We went to the photographic museum just around the corner and did the usual caleche rides and trying to avoid the monkeys in the Jemaa el Fna! Then on to the huge contrast of Douar Samra – this place is such a gem….I was getting a lot of raised eyebrows from the family as our bags were packed onto the donkey to take them down the dirt road into the village, “how much research did you actually do, where are we? !” But once inside and welcomed warmly with mint tea the family soon relaxed. Love it there, such a good mix of basic traditional with hot water, comfortable beds and good communal dinners – the whole family really enjoyed that collective experience. The guide for the walk was brilliant, a bit too strenuous for some of my family who left after 30mins to go back to relax in hammocks, but my other 2 children and I loved it – proper walking! I never would have considered staying there if you hadn’t offered it as an option on your website, but other people from around the globe flock to Samra as its part of the known trekking trails, but being a suburban stroller after a sunday lunch would never have found out about it, but so pleased I did. All in all a wonderful break, thank you for all your help. It was great to escape and open my children’s eyes up to a different type of holiday…..I’m saving up for the next trip already, hopefully I’ll be back in touch next year for our next adventure. Nimmi B. September 2016: ‘Thank you ( and your team) so much. We had a fantastic time at the Rebal Riads with Mohammed and Fatima and all the staff making sure were 100% ok and able to relax and enjoy our family holiday. Stephanie L. September 2016: ‘ Fleewinter was amazing. The team made the process very easy, everything was arrange and sort out very quickly and super efficiently. Email answered straight away and always someone over the phone to answer our questions. We love the extra help and informations provided by the app Vammoos. Cab was perfect. Super comfortable and safe cars, which is important while travelling abroad, with very nice drivers. Villa Reballi was amazing. The accommodation by itself is perfect, beautiful villas and surroundings, very luxurious and comfortable. But what makes the experience extra special is the staff there. Mohamed the manager is exceptional, always providing informations and tips and arranging outings for you in the best possible way. Fatima and the rest of the staff are the same, welcoming you very warmly and genuinely super nice and super efficient. A little paradise ! Sidi Kaouki is a dream destination, not far from Essaouira, 5 minutes to the beach and very cool weather even in summer. We Like very much eating in the little village “Momo’s” being our favourite, very cheap and lovely service. As for the night we enjoyed very much eating out at “Kaouki hotel” (recommended by Villa Reballi), great, great food, and very atmospheric setting with the candle lights !!! Kanwal A. August 2016: ‘We had an absolutely lovely time – not easy with the needs of 3 generations! Both Riad Sila and Valmar were beautifully decorated with lots of useful details. The grounds and pool areas were great and the meals we had prepared for us were excellent. However, a particular mention has to go to the superb staff especially Mohammed and Fatimah for whom nothing was too much trouble. It really is a ‘home from home’ – Fleewinter has created just the right balance of the privacy and the amenities of a hotel. We all loved our trip. Lindsey T. June 2016: ‘Excellent holiday. The Riad was lovely and in a great location. The team at Riad Adore could not be faulted – they were friendly, efficient and very informative – nothing was too much trouble. The food [and the hammam] at the Riad were also first class. Barbara was extremely helpful and informative and kept in touch throughout the whole process. Maria L. May 2016: ‘I don’t know why we haven’t been to Morocco before. We had a fabulous holiday and only wish we had stayed longer. Barbara was absolutely superb in recommending places to stay and minor changes to length of time staying was no problem along with all the extras like the cookery lesson and advice on walking…. All superb. Douar Samra was great…exactly what it says about it… Simple but trad accommodation. Rashidas food is superb…everyone was so welcoming… All the people are delightful and friendly. Views fabulous and walking great…we will be back… Climbing Toubkal next time!!! Riad el Zohar was so welcoming and like staying in someone’s home. Allan was incredibly helpful with restaurant recommendations and apps to help get around… Rooms are lovely and service impeccable. The souks were fascinating. We especially liked The Ben Youssef school and the Photography museum…as well as the Bahia and Badi palaces… Both different but both well worthwhile. And of course the majorelle gardens with the excellent Berber museum. Nomad restaurant was highly recommended but we were not impressed….. Due tomits popularity our feeling is they were trying to get more people crammed in … A romantic dinner for 2 was alittle uncomfortable as the tables on either side were only 6 inches away …we had booked the roof terrace but it was alittle chilly that night. Bobbi B. April 2016: ‘We had a very enjoyable holiday. Essaouira was perfect for our young family. The Rebali Riads were beautiful. The pool was a little on the cold side but this didn’t stop the kids going in 3 times a day! Mohammed and Fatima make the stay and are very friendly and helpful. Rosemary H. April 2016: ‘We booked our holiday through Fleewinter because we had been so pleased with our previous holiday arrangements booked with you three years ago. Karen R, March 2016: ‘It was clear that Anna had real expertise and local knowledge. I felt comfortable leaving the bookings in her hands and going with her recommendations – which is a big thing for me as I am usually a control freak! It was also really nice to speak to someone on the telephone rather than just booking online. Anna was also very responsive to my emails and always answered my queries very promptly. Very happy with the service and would absolutely use again and recommend to friends. The private transfers really made our holiday so easy and relaxing. We had a wonderful driver, Mohammed. We liked him so much we asked if he could do all of our transfers. In the end he did three – the only exception was the trip to the airport on our last dat. He was very nice and accommodating. We were not able to do the camel trip at the desert as planned due to the weather, so the next morning when it was sunny he made sure we did get the chance to do a trek and waited and extra 45 minutes for us. Truly outstanding service. We especially loved the desert camp – it was a unique experience. Our host, Allan, at Riad El Zohar was outstanding. So helpful and welcoming. Would recommend Scarabeo and Riad El Zohar to friends as outstanding. Shirley B. January 2016: ‘Alan and his staff at El Zohar are very very good hosts. Cookery lesson was excellent, including trip to parts of the souk we’d never have found ourselves. Villa Dinari is such a special place, I can’t say enough about it. Heather and Abdel provide a very clever blend of relaxation and fun. We’ve made lovely new friends both times we’ve stayed. The new ‘wing’ is fantastic. I’d hate anyone to visit the Medina and miss Dar Cherifa, what a sublime place. Will return again and again. We managed to get a short notice table for dinner at La Maison Arabe, very special location but very busy. Food superb, tangia in particular. Heather also managed to shoehorn us into Dar Yacout! This was I think the highlight of the visit. I was expecting a touristy vibe but nothing of the sort, very intimate and special experience. Although the amount of food is on the obscene side. We had dinner at a riad restaurant El Badia which was poor, wouldn’t return there. Kosybar was superb, went in the evening. La Terrasse des Epices was very cool, nice tea venue. Cafe Arabe was ok, service not great, good cocktails. Cafe des Epices food was ok, more the location. They now have another place diametrically opposite called Nomad, on quite a few floors. That was worth a visit. The big disappointment in terms of venues was the SkyBar, dreadful place. Really dirty, cocktail and champagne were returned to them, shocking service. Grande Cafe de la Poste never fails to deliver, a classic. Deborah W. December 2015: ‘We just wanted to thank you so much for all the arrangements that went into making our holiday to Morocco so wonderful. Everything worked well, bar the minor problem with the porter in Marrakech. The 2 places we stayed at were perfect, and the staff at both could not have been more delightful, helpful, friendly and efficient. Likewise our drivers, in whose care we felt safe and well looked after. The cooking lesson in Essaouira was great fun, especially the guided visit to the spice market. Simon and Kezia also enjoyed some quad biking, while I preferred a more leisurely morning on a hired bike. We had great meals at Elizir and Caravanne Café – both are more than just the meal – the unexpected settings, decor and ambience were just wonderful. And then by huge contrast: Marrakech! We loved the Riad el Zohar and we quickly found our way round (Simon’s excellent map-reading skills). One thing that could easily have disheartened us was frequently being told by locals in the Medina that wherever we were heading was closed that day, and we should rather go and look at the Tanneries! It was only because we had been alerted to this practice in one of the guidebooks that we steadfastly refused to be diverted. They always seemed so convincing, though, and less determined tourists could easily be caught out. Please do warn future travellers. Eating out in Marrakech was a bit of a challenge with a vegetarian. However we had 2 excellent meals at Café Arabe, which has much more atmosphere in the evening. We also discovered Nomad, just off the spice square, where great food was let down by less than great service on the night we went. It’s imaginative, modern cuisine, and when they sort out the service issue, will be a great place. We also enjoyed lunch at the café at the top of the Photo Museum – both worth a visit. Helen P. December 2015: ‘It was great. We were very well looked after by Fleewinter. I usually travel independently and not with a travel company, but as I wanted only a short trip to Morocco, and as it was my first time to the country, I decided to go with a package deal to make life easier. And I’m very glad I did. We had a bit of a mishap at the beginning of our trip as my friend missed the flight, so I flew to Marrakesh alone, and then she joined me that evening when she managed to get another flight. She was in touch with Anna from Fleewinter, who arranged another pick up from the airport for when she arrived, which was great. But apart from that mishap, the holiday was fabulous! The country information provided by Fleewinter was very useful to read beforehand. Fleewinter were a dream to book through and provided excellent customer service from day 1. Their package was excellent value in comparison to other travel companies, and the quality of the accomodation was fantastic. They were both very special places, so many personal touches which made them feel 5 star, and friendly and helpful staff. Anna suggested the 2 guest houses, and I couldn’t have been happier with her choices. I had no issues with the booking process, it was all very straightforward, we checked the availability, then bought the flights, then confirmed and paid for the package. Both places were without fault. Really individual, beautiful Moroccan textiles and decor, friendly and welcoming staff, excellent food (b n b in the city, half board in the mountains), lots of useful information about the area in both places, comfy beds. I’d recommend them to anyone. The magnes trois in Marrakech was good too I would still give it a 5 – but we didn’t like it as much as the other 2 places we stayed, perhaps because we had been surrounded by such wonderful space and peace and quiet magnes trois perhaps felt a little squashed and noisey. The staff were lovely & really went out of their way to help you but we didn’t love it as much as the other places and we don’t really know why. Margaret A. December 2015: ‘When we started discussing this holiday with Barbara we felt we were in safe hands. She was sympathetic to our needs and gave us good suggestions on how best to achieve the itinerary we settled on. We were very satisfied. The airport transfers were perfect – pleasant drivers, clean cars. Our driver Khalifa was very courteous and utterly reliable. He was a very good driver and we felt safe at all times, even on the winding High Atlas roads. The Toyota Landcruiser was absolutely fit for the terrain, and was reliable and spacious. Les Trois Mages was ideally situated close to the souk, but in a peaceful location. It’s a very pretty Riad and we found our room comfortable and well appointed. Aziz, the manager, was so attentive and courteous. The dinner on our first evening was delicious. Jardins de Skoura – our favourite. Caroline was a perfect hostess and went out of her way to ensure we enjoyed our stay.The room was welcoming and comfortable and the location within the palmerie is delightful. We could have happily stayed an extra day. Hotel Yasmina. The setting is amazing – right on the dunes. The room was a little tired looking and the place had more staff than clients. There was only one other couple at dinner that first night. There were no other people on our camel trek and we camped in the desert alone, however we were looked after very well by our guide Ibrahim, and, at the camp, by Mustafa. After dinner they entertained us by singing and playing their drums before we went outside to view the Milky Way – fabulous! We spent a surprisingly comfortable night in our tent. Kazbah Azul in Agdz – A lovely setting, pretty gardens, a comfortable room and the best food of our holiday. We saw little of the owners but the place seemed to be virtually run by a lady called Majuba. She was delightful! Cindy R. November 2015: ‘Thought Rebali was excellent with a v good cook which was such a treat; Mohammed was incredibly helpful with all we wanted to do and all the staff were exceptionally friendly. Jean L. October 2015: ‘Thanks to your company, we had an absolutely brilliant holiday in Morocco. This was our first experience in Morocco. The itinerary, accommodation and transportation you put together was an excellent introduction to a country which we would all love to return. Hopefully, we will use your company again and will definitely encourage others to do so. We had 3 drivers over the course of our 10 day journey. They were all very good: pleasant, knowledgeable and helpful. We loved Riad Hikaya, Agdz and Dar Zitoune! I could have done with a couple of more days in Dar Zitoune. Matt S. October 2015: ‘The booking process was excellent. We felt you translated our requirements into an itinary well and understood the needs of a family with 3 children. The information provided allowed us to be sure that we had the right sort of accommodation. All the communication was prompt and helpful. Reballi Riads, Dar Medava, great accommodation , really welcoming staff, great food, trip out to buy and prepare our meal was fantastic, thank you chef. A few bits of maintenance would help to keep it in top condition- a few lights out, leaking sink in the kitchen. The DVDs and games were appreciated. Cake and tea in the afternoon was a nice touch. Rod B. September 2015: ‘This was our third holiday to Morocco booked through Fleewinter and as on our previous trips everything went smoothly and my wife and I were completely satisfied with all the arrangements. Alasdair and his team supplied us with all the information that we needed for our stay in Marrakech and Essouria and could not have been more helpful. The booking and payment were all arranged perfectly on line. I had mentioned to Alisdair at the time of booking that as we were scheduled to arrive at Marrakech airport at 2050 hours on 01 September it would be nice if a light evening meal could be arranged at the Riad Zolah. This he did for us and we were able to enjoy a lamb tagine in the tranquillity of this lovely riad. Many thanks Alisdair. The big air conditioned taxi was at the airport to meet us and the English speaking driver was excellent. Fleewinter had also arranged for us to be picked up on the morning of 4th September from Riad Zolah and driven to Essaouria. Again a nice big aircondioned car with a charming English speaking driver who arrived on time and was able to give us information on the places that we passed through and on Morocco in general. No problem with the taxi on our last day too. He arrived on time in the big taxi and got us to Marrakech Airport in plenty of time. He also spoke English but not quite as well as the other two. Nevertheless he was very pleasant and we had a nice chat along the way. Riad Zolah is fantastic as are the staff who could not be more helpful. We stayed there in September last year and it was our first choice for accommodation this year. My wife and I cannot rate it highly enough. The room was lovely with bowls of fruit and nuts on the table for us everyday. We were there for three nights. The only minus was that when I came to settle the bill for extras the credit card reader was not working. No problem though as I had enough dirhams. They said that there would be no charge for the light meal that we had on arrival so you just can’t beat that for service. The Dar Maya was a smaller and more modern boutique Riad but recently built in a traditional style. The air conditioned room was very nice with a large and extremely comfortable bed. We met the owner, Gareth Turpin, on our second day there as he had only arrived back from a short stay in the UK that morning. Gareth and his staff were all charming and extremely helpful. They were able to recommend some lovely restaurants in the Medina. One of our favourite places in Marrakesh is Jardin Marjorelle. It is so peaceful in there and we love it. 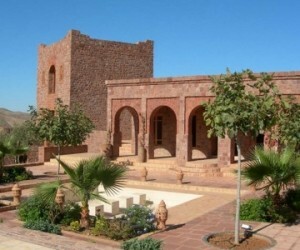 There is a small café within the gardens together with a Berber Museum. Another place we like to go to is the Mamonia Hotel. Have a drink or two there in the afternoon with small trays of nibbles and then stroll around the garden. The interior décor of the hotel is absolutely fantastic. The terrace of the Café Arabe is a great place to eat in the evening and to watch the sun go down. Whilst in Essouria we had our first evening meal on the terrace of the Taros Café which was very good. The second night we went to the Elizir and we both thought this to be fantastic. The owner is a charming Moroccan man who has spent a lot of time in Bologna and his food, especially the fish (my wife had the John Dory and I had the sea bass) is fantastic. It is a very small menu but that means quality and there is something for all tastes. We were so impressed by this quirky place with all the old televisions and other objects scattered around that we returned on our last night too. We would highly recommend this to anyone who enjoys good food. Bill P. September 2015: ‘The trip to Morocco was amazing! We had already booked some accommodation for the first 4 nights and we were able to seamlessly continue the trip across the south of the country to arrive in Marrakech and spend time before returning home. Visiting Morocco in August may seem a little foolhardy, but in fact the time spent near Essouaira was warm with a breeze, and temperatures increased steadily as we travelled inland (eastward) with our Fleewinter guide, Mahjub. He really made the difference as we saw, met and visited areas that would not have been possible without his willingness and knowledge of the area. The complete trust we had in him was preceded by kind and helpful people en route; in Marrakech we had no problem at all embracing the vibrant atmosphere of the bustling city. My daughter is pressing for us to go back in February – trust me, that is testament to the wonderful time we had! Very slick, helpful and informative would be the simplest way to describe the Fleewinter experience. We had to tag our daughter onto the trip at short notice and even that was a seamless process. I can’t thank the team enough (especially Barbara) and I wouldn’t hesitate in travelling with Fleewinter again, or recommending Fleewinter to friends/family.We went on a morning’s cookery course at Atelier Madada in Essouira – great experience and value for money. While the self-prepared food finished cooking we went into the souk to meet the spice merchant which was fun and educational. Taroudant is a gem of a place and well worth its reputation as a ‘small Marrakech’. The souk is amazing and the city has a fascinating history. As mentioned before, a guide is well worth it to get the most out of a morning in a wonderful location. Janine B. June 2015: ‘It was well worth doing a 3 centre holiday as we were able to see more of Morrocco and get a feel of life for local people. We enjoyed every location and the time in each location was perfect for us – plenty of time to explore but not too much time to get bored. James G. May 2015: ‘Incredibly well organised. Fleewinter demonstrated a great understanding of the type of honeymoon we wanted and accommodated with ease any changes to the schedule. It was the most personable travel service we have ever come across. 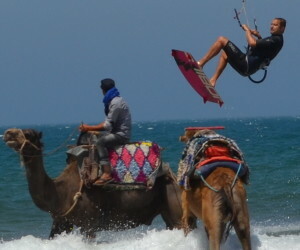 Surf School in Sidi Kaoki – Amine is a great guy to be in touch with for all things kite surf. He even lent me his personal board. A great place to have sundowners. A hidden gem on the surf circuit. Cookery Course – Kandusi (Chef) was so engaging and we both left Morocco with lots more tools in our toolbox to be able to create some authentic cuisine. A great day! Vicky B. May 2015: ‘We surprised my sister with a weekend in Marrakech for her hen do. We had a weekend to remember for all the right reasons, Marrakech had everything to offer and more. We visited the souk markets day and night, trekked 7miles of the Atlas mountains and experienced the traditional Hamman that was fit for kings! Loved every minute of it. The Medina was clean and everyone was really friendly. Christine M. October 2014: ‘Just wanted to say my family and I had an amazing time at the Rebali Riads, we loved everything about the setup. The location, the riads, the food and most importantly the staff who very so accommodating and charming. I hope we will have the opportunity in the future for a return visit and or try another Fleewinter destination!